Ever needed to change a term or name across one or more records? It is a painful process that requires going into each record, editing, finding each field that may have that value, replacing, saving, going to the next record, etc. 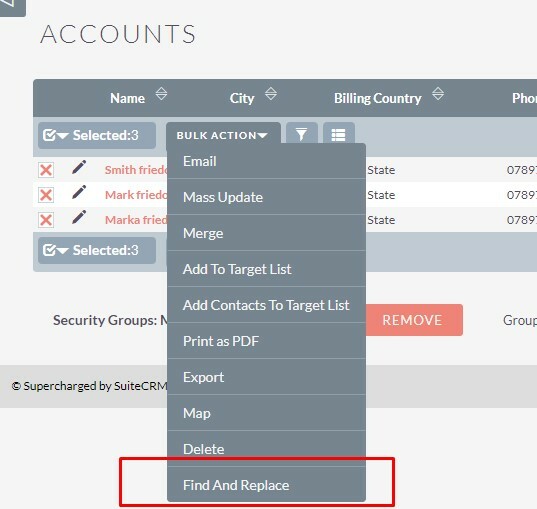 With Find and Replace it can be done in seconds all from the list view. Select which records to do then run the Find and Replace tool. Find and Replace available as a menu item in List view of all modules as a Bulk action. Need to show or hide fields or panels based on the value of another field? For this requirement Dynamic Panels is the perfect solution. The advanced configuration tools allow you to clearly define what should happen whenever a field value changes.